At the end of September I, and some of my fellow CMS guides, finished our second season of running climbing camps for a non-profit organization called First Descents (FD). 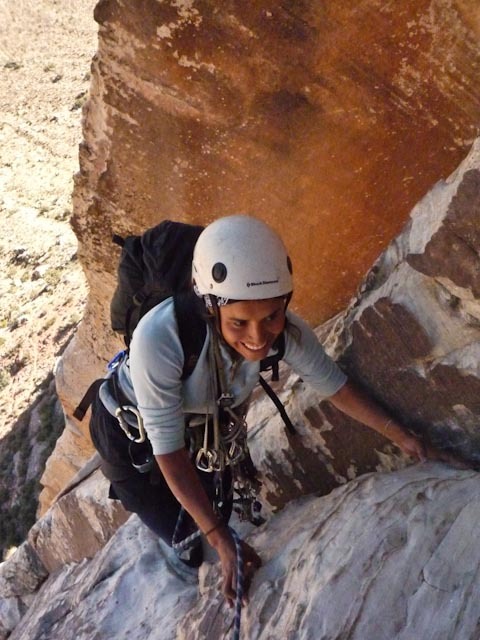 They provide adventure programming for young adult cancer survivors, roughly ages 20-40. I know the name does not seem to fit with climbing, but the organization started out providing kayaking camps – and where climbers look for that coveted first ascent of a route, paddlers look for the first descent of a river. FD camps are 6 days long, and like many climbing adventures, the first and last days are travel days. The real meat of each camp happens during the middle 4 days with 2 days of top roping and multipitch prep work to build everyone’s skill sets so they are ready for the graduation climb – a full-blown multipitch climb on the final day! 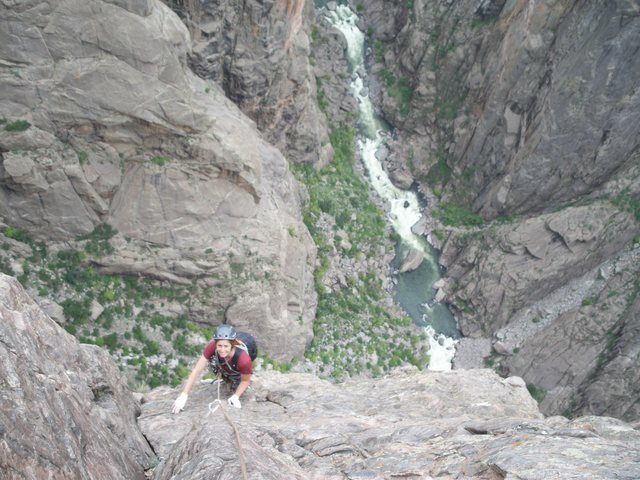 There is one well-earned non-climbing day thrown in as well when campers get to sample some of the local sights in the program area like Estes Park, CO or Moab, UT. FD campers (and sometimes the volunteer staff) arrive with a wide range of cancer experiences – from folks who have been out of treatment for many years, to campers who are recently diagnosed and still in the midst of treatment. 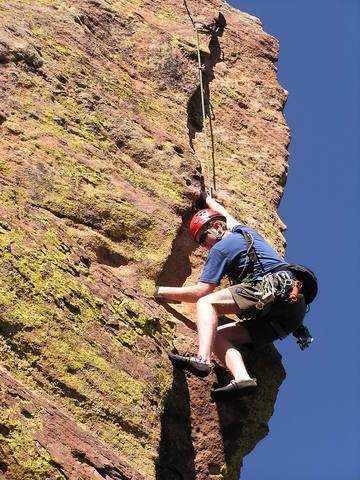 Climbing experience runs the gamut as well, from total novices who have never been on a rope (indoors or outdoors), to the occasional camper who has done some trad or sport leading. And while a typical guided climbing experience tends to focus on climbing or educational objectives, these take a backseat to FD’s main objective – creating a community for a group of cancer survivors who frequently have had to go through the challenges of cancer with a relatively small to non-existent support network. I am continually amazed how many times I hear campers say, “Until this week, I have never met another young adult cancer survivor.” After camp, however, they know 10-15 folks who they don’t have to explain cancer to, who understand first-hand the intricacies of cancer treatment…people who ‘get it’! Never mind the connection they make to the larger FD family which is growing all the time. The community they build is a powerful tool – not only at camp where campers support and encourage each other on and off the rock, helping each other achieve more than they dreamed they could…but also, after camp. I love hearing the post-camp stories about campers who feel like their camp experience was the impetus they needed to realize that they have too long allowed cancer to run their lives, that they feel like they have gone home, taken their lives back and have started to realize some of their pre- and post-cancer dreams. Dreams like writing music, starting a non-profit, publishing a book, mending broken relationships, quitting a hated job and starting a dream job for much less pay, moving to Colorado, completing a triathlon or marathon, climbing on their own even though they are terrified of heights…the list goes on and is incredibly inspiring! For a CMS climbing guide who (like my peers) is passionate about seeing people stretch their physical, mental, emotional and spiritual limits through climbing and the mountain environment… what is there not to love about being a part of the First Descents experience?! FD season can’t come soon enough – I can’t wait! For more photos check out Photo Adventures with Ed. For most of us (in the Front Range anyway), when we hear the name “Eldorado,” we immediately think of our beloved Eldorado Canyon with soaring brown, red, and neon-green walls. We think of how good the movement is on the warm Fountain sandstone and we think of the innumerable, quality routes inaudibly beckoning us like sirens seducing ill-fated sailors…or, as the case may be, desk-jockeys. We think of the incredible amount of climbing and, best yet, how short the approaches are. But in the great Northwest, there lies another Eldorado. Unlike it’s Colorado cousin, Eldorado Peak pretty much shares none of those aforementioned attributes. The rock quality is poor and treacherously loose, relegating the few routes to low 5th-class ridge climbs; and the approach options to Eldorado’s W. Ridge are all very long by Colorado standards. Though, I will say, the views are simply spectacular. CMS guide Eric Whewell and I, training for an upcoming alpine exam, walked the long approach to the base of Eldorado’s E. ridge. Here we set up our camp as the sun disappeared and the moon simultaneously arose. 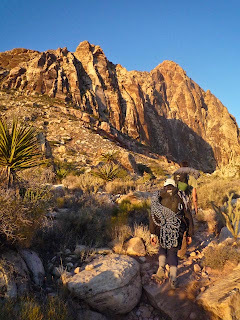 We left our camp early in the morning and essentially circumnavigated the Eldorado massif, dropping through a col between the Tepah Towers and Dorado Needle. This was done by headlamp, connecting various glaciers that required extensive roped travel to manage the considerable crevasse hazard. After yet a few more hours of approaching, we finally reached the 3000′ W. Ridge. 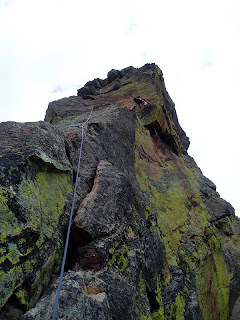 The climbing started out easy enough and we simul-soloed a third of the ridge before deeming the rock quality and difficulty just enough to warrant the rope. 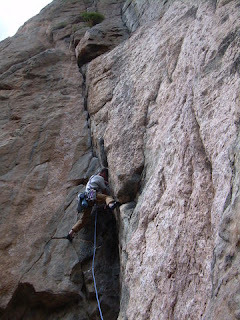 We led in blocks, either outright pitches or simul-climbing, swapping leads whenever our small rack ran out. I think most people take rock shoes up this route though the moderate grade of 5.7 felt comfortable in our La Sportiva Trango S Evo boots. (We found a very munched Muira shoe near the top of the second third of the ridge.) The difficulties were mostly found in simply managing the loose rock. The hardest climbing came on a poorly protected traverse with a piton at the start but, at least, this section was short. Higher on the route, the ridge blended into a headwall comprised of infinite ledge systems. The information we had said we only had another 500′ or so to go but it seemed endless. Each “summit” turned out to be only another bump leading to more ledges. Finally, seven hours after leaving camp, we reached the summit. A short but elegant snow-arete forms the upper part of Eldorado’s E. Ridge but the going was much easier than anything we’d been on yet. We cruised down the E. Ridge, sometimes on rock, mostly on glacier and, 15 minutes later, were back at our camp. 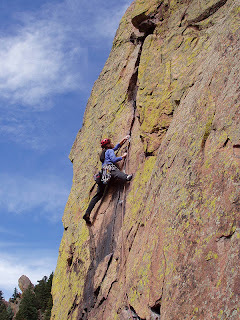 Of course, this still left us with a 4.5 hour “approach” to get back to our car making us appreciate even more the ease of alpine climbing in RMNP let alone rock climbing in Eldo. 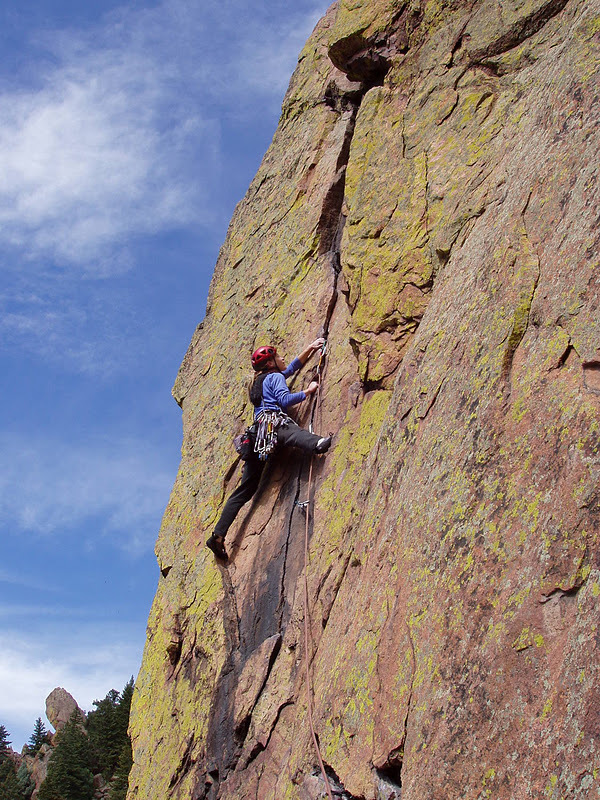 Located approximately 12 miles up Boulder Canyon, Castle Rock is a wonderful place to climb granite. There are a wide range of routes available. Anything from single-pitch to multi-pitch, 5.4 to 5.14. Since I was heading to Yosemite soon, training at Castle Rock was the perfect choice. 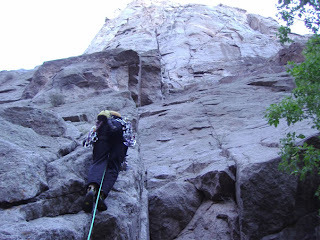 My climbing partner and I climbed a few single pitch routes that morning before I decided to hop on “By Gully”. 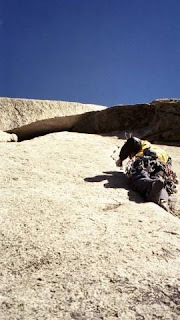 This route is rated 5.9+ and is the wide crack just left of the large roof. 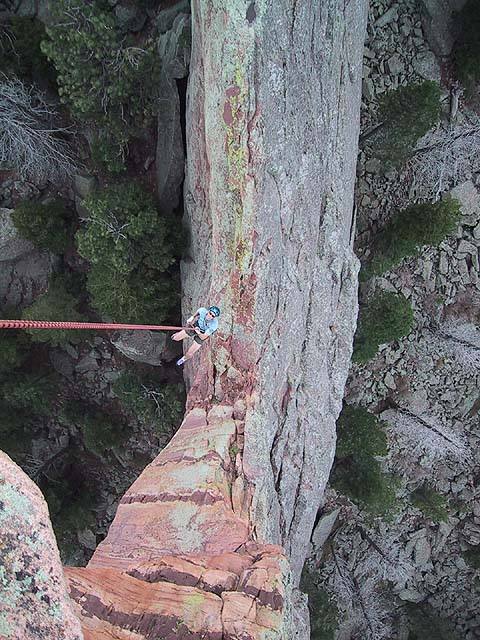 It is an offwidth so be prepared. Boulder up to a bolt and clip it. I used a standard quickdraw and didn’t feel any rope drag because of it. Make a funky move to a hand crack and place a #1 Camalot. You could probably place a #2 Camalot, but my I didn’t want to take that place because I used it as a hand jam to get into the wide section. From there I went right side in. Last year I tried this route left side in and it didn’t work. Right side in worked great. With my right side in, my right arm was a chicken wing and left hand palming down on the rock. I cammed my right foot in the crack and wiggled my way up a few feet. I was then able to place a #2 Camalot and then quickly after that a #4 Camalot. From there I placed a #5 Camalot and walked it for a little ways. After that I placed a #6 and walked it for most of the top section. The section where I placed a #5 and #6 is mosly heel/toe and much more mellow than the first offwidth section. Once you get near the top you can do one of two things. 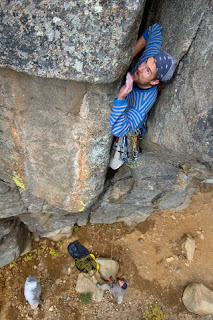 You can traverse over (climbers left) to the sling anchor on “Coffin Crack” or build a seperate anchor above. 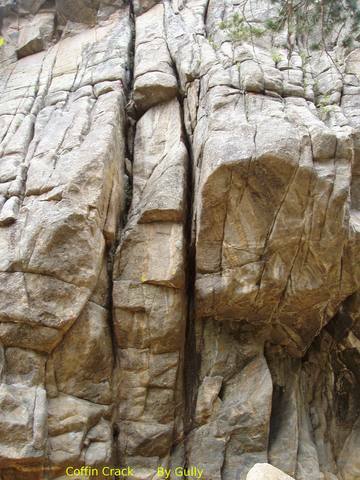 If you “enjoy” offwidth climbing, I highly recommend “By Gully”. This route will make you work for it, but when you get to the top, it is well worth the struggle. Note: Wear long sleeves and knee pads. It takes the pain down a bit. 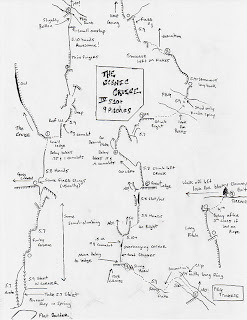 Colorado Mountain School Guides can guide this route if you are interested. If you have any questions, give us a call. Rocktober is just around the corner! Where are you going to get your send on? Red Rocks! Vegas, baby! 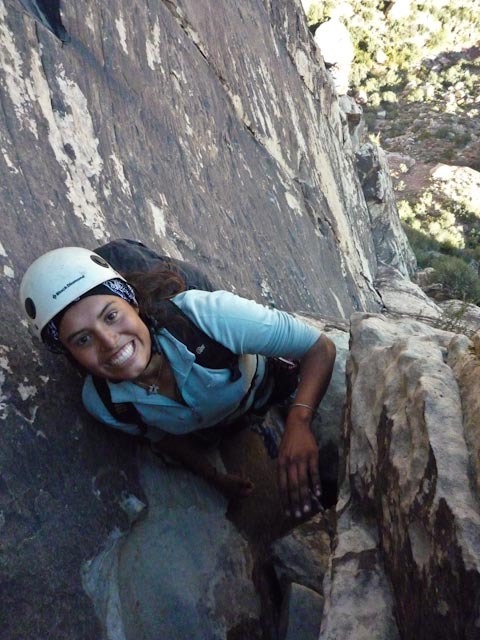 Could you think of a better fall destination for a brief climbing trip?! As things start to get frosty on long routes at elevation in Colorado, the desert is just starting to get into prime time! 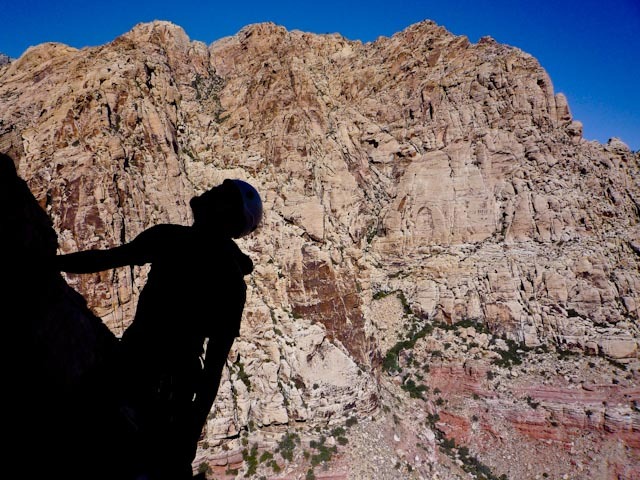 I have returned to Red Rocks again and again… to work… to play… to train… to CLIMB! 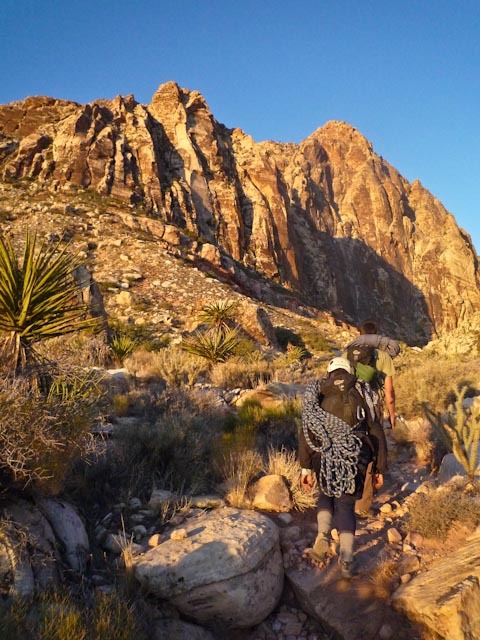 Situated right outside of Las Vegas, Red Rock Canyon National Conservation Area is a world class destination. It is one of my favorite spots due to the immense volume and variety of climbing- excellent sport or trad climbing, world class lengthy multi-pitches, sun or shade, crack or face. 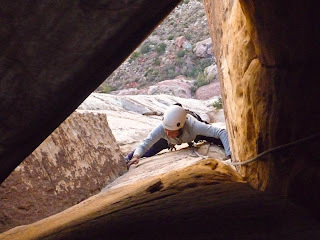 There are plenty of hard routes in Red Rocks, but it is particularly noted for having exceptional long moderate outings, with enjoyably sustained climbing of just the difficulty to meet any climber at the level they are at. Want a mellow, but enjoyably steep outing? Bing, Cat in the Hat, with six pitches of 5.6 going up the stunning formation that is Mescalito. 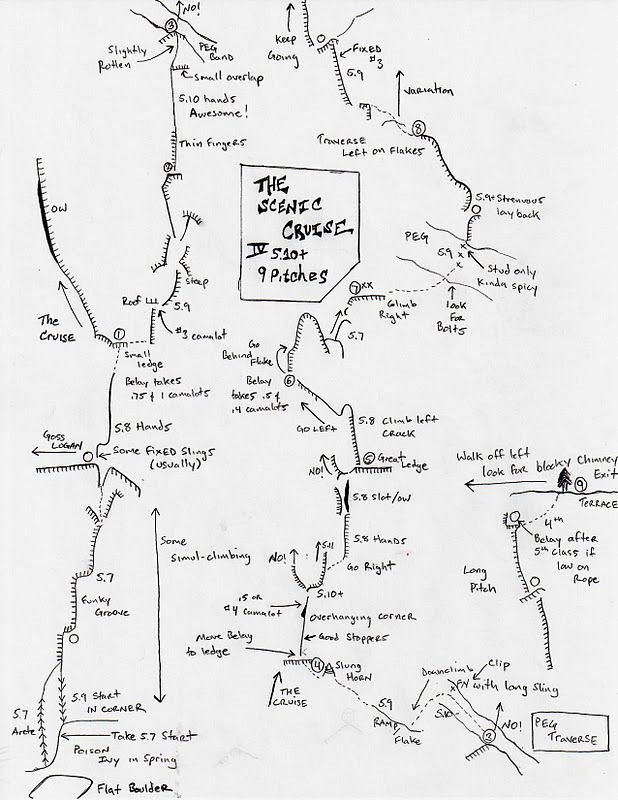 Want to climb a route that takes all the juice you’ve got and all the light of the day? Boom, Epinephrine, considered by many to to be the best 5.9 in the country, sucking you in with a monstrous 13 pitches. Don’t be scared off by rumors of endless chimneying- there are plenty of splitter cracks and endless corner systems in there too. There are also many high quality cragging spots to work on your climbing or leading techniques and to rest your legs for the next big day out. 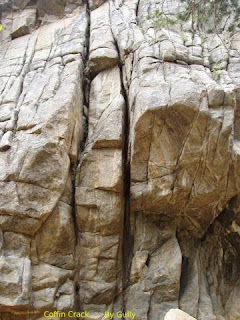 One of the all time classics is the six pitch 5.8, Frogland, situated at the mouth of the astounding Black Velvet Canyon. This climb has it all, pitch after pitch, with high end crack climbing, face climbing and corner climbing with a very cool tunnel through up high. Oh, sooo good! 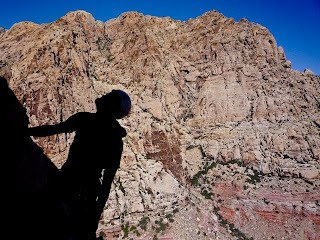 Below are some of the photos from a vertical adventure I had on it with two happy clients. 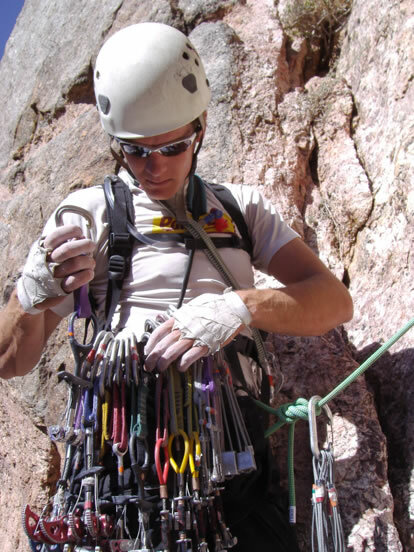 Colorado Mountain School has permits from October 22-31. There are limited spots available, so please call the office now if you want secure a spot. The friendly staff working in the office are happy to answer your questions and work with you to cater to your needs. You can also learn more online here.